WE ARE ONE OF THE MOST EXCLUSIVE GROUPS. OUR HOTEL OFFERS SOME FANCY ROOMS, A RESTAURANT & BAR AS WELL AS A MODERN GYM. OUR STAFFS IS HAPPY TO HELP YOU! 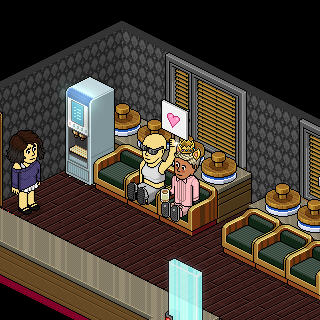 JOIN THE HOTEL DELUXE FAMILY AND START WORKING AT ONE OF THE BEST HABBO AGENCYS! To all those ppl who thought im a bad person. This group is designed for those habbos who wish to roleplay as an inmate and be under the watchful eye of the HPS Guards. [DoD] Department of Defense I. Join group to enter the room. Rights 15c. Contact .Alison, Only. Fast Pass is 35c Please trade Sirbryanrob or eldrin01 to accept request after you pay!! Taken in this room on 20 August 2018 and received 2 likes. Taken in this room on 15 August 2018 and received 2 likes. Taken in this room on 26 June 2018 and received 1 likes. Taken in this room on 25 June 2018 and received 0 likes. Taken in this room on 7 June 2018 and received 2 likes. Taken in this room on 18 May 2018 and received 0 likes. Taken in this room on 28 April 2018 and received 0 likes. Taken in this room on 17 April 2018 and received 1 likes. Taken in this room on 12 April 2018 and received 1 likes. Taken in this room on 30 March 2018 and received 1 likes. Taken in this room on 16 March 2018 and received 1 likes. Taken in this room on 14 March 2018 and received 0 likes. Taken in this room on 8 March 2018 and received 0 likes. Taken in this room on 2 March 2018 and received 3 likes. Taken in this room on 24 February 2018 and received 0 likes.